The number of doctorates being awarded around the world has almost doubled over the last ten years, propelling it from a small elite enterprise into a large and ever growing international market. Within the context of increasing numbers of doctoral students this book examines the new doctorate environment and the challenges it is starting to face. 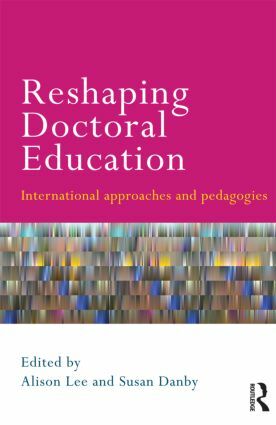 Drawing on research from around the world the individual authors contribute to a previously under-represented focus of theorising the emerging practices of doctoral education and the shape of change in this arena. Reshaping Doctoral Education provides rich accounts of traditional and more innovative pedagogical practices within a range of doctoral systems in different disciplines, professional fields and geographical locations, providing the reader with a trustworthy and scholarly platform from which to design the doctioral experience. It will prove an essential resource for anyone involved in doctorate studies, whether as students, supervisors, researchers, administrators, teachers or mentors. Alison Lee is Professor of Education in the Faculty of Arts and Social Sciences, University of Technology, Sydney, Australia. Susan Danby is a Professor of Education in the Faculty of Education, Queensland University of Technology, Australia.